This simple marinated octopus salad will transport you to sun-soaked island even in the depths of winter. The octopus is cooked until tender and then marinated in olive oil, vinegar and garlic. Serve as a starter, preferably with an ice cold drink on the side. This simple marinated octopus salad will transport you to a sun-soaked island even in the depths of winter. The octopus is cooked until tender and then marinated in olive oil, vinegar and garlic. Serve as a starter, preferably with an ice cold drink on the side. Remove the packaging from the octopus and place in a large bowl. Fill the bowl with cold water and allow to gradually thaw. Bring a large pot of water to the boil. Reduce heat to a simmer and add the bay leaves and salt. Add the octopus and simmer for 45 minutes. Drain and allow to cool. If the octopus still feels a bit tough then continue to cook for another 15 minutes but don’t overdo it! 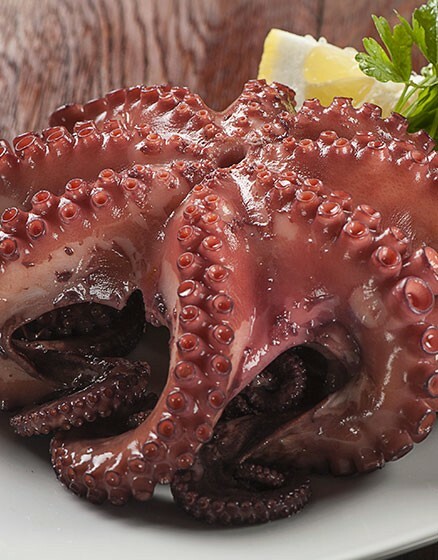 Cut the cooled octopus into bite-sized pieces and place in a bowl with the minced garlic, olive oil and vinegar. Leave to marinate for at least 30 minutes. Add the chopped onion and parsley and season to taste with salt and freshly ground pepper. Serve as a starter at room temperature. 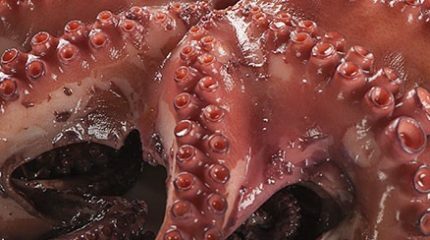 Large frozen Octopus – between 1.5kg to 1.7kg in size. Delicious stuffed with herby breadcrumbs and creamy feta cheese. A very flavoursome, quick way of cooking Clams. Great recipe – with an excellent combination of flavours and only 10-15 minutes to prepare.